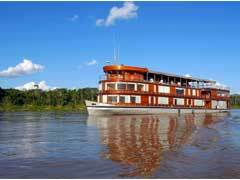 Amazon Cruises - Brazil or Peru? Seriously, can you go wrong when there’s a choice of taking an Amazon River cruise? I don’t think so. Whether you leave from Brazil or Peru, you are embarking into a world of the unknown and you will return with a new outlook on life. The Amazon River just has that affect on people. With her beauty and underlying secrets, you can’t help but be mesmerized by her splendor and magnificence. While the Nile in Africa has the record for being the longest river, the mighty Amazon is no mere second fiddle or runner up. The River is nearly 4,000 miles in length and her delta opens wide near the largest city of Manaus. She is strong and roars loudly through both Brazil and Peru and either route on an Amazon cruise will prove to be the perfect choice. The Amazon dominates South America with her winding river and lush rainforest. In some areas of the Amazon, the vegetation is so thick that sunlight cannot even penetrate to reach the rainforest floor. More than 200 rivers and streams flow in the Amazon making her the mightiest river on the South American continent. Subsequently, no bridges cross the river, making it easier for small ships and vessels to navigate and bring civilization into this world of unknown to see the indigenous wildlife and tribes-people that live along the Amazon. These are only a few Amazon River facts that will entice you while planning your Amazon cruise. There is no right or wrong answer when visiting the Amazon. The question lies in what Amazon tours you want to take. Both ports, Brazil and Peru offer a wide variety of pre and post cruise options as well as excursions during your Amazon cruise. By selecting a Brazil cruise, you can take advantage of the beaches in Rio de Janeiro, Sao Paulo or visiting the Iguassu Falls. A Peru starting point will offer the chance to see the confluence of the Rio Ucayali and Maranon Rivers as they flow into the Amazon River. The options are plentiful. Choose from the following: bird watching, natural park visits, wildlife reserve visits, trekking, nature hikes, canoe rides, piranha fishing and night excursions. When your Amazon cruise is over, you will have had close encounters with so many new and different species only found in the Amazon. You are sure to return with a new understanding of the importance of taking care of this sensitive eco-system known as the Amazon.